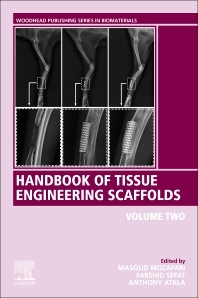 Handbook of Tissue Engineering Scaffolds: Volume Two provides a comprehensive and authoritative review on recent advancements in the application and use of composite scaffolds in tissue engineering. Chapters focus on specific tissue/organ (mostly on the structure and anatomy), the materials used for treatment, natural composite scaffolds, synthetic composite scaffolds, fabrication techniques, innovative materials and approaches for scaffolds preparation, host response to the scaffolds, challenges and future perspectives, and more. Bringing all the information together in one major reference, the authors systematically review and summarize recent research findings, thus providing an in-depth understanding of scaffold use in different body systems. Farshid Sefat is a lecturer in Medical Engineering at the University of Bradford and Visiting Professor at Stevens Institute of Technology (New Jersey, USA). Previously he was Head of the Biomedical Engineering Department at King Faisal University (Saudi Arabia). He completed his post doctorate research at the University of Sheffield (UK) in the area of cornea tissue engineering. He received his Ph.D. (2011) and BEng. (2005) degrees from the University of Bradford (UK) in Biomedical Engineering. He also obtained his MSc. (2006) in Biomedical Engineering (Cell and Tissue Engineering) from Keele University, (UK). His research is based on developing biomaterials to control cellular behaviour with particular emphasis on developing engineered materials for tissue engineering. University of Bradford, Bradford, UK and Visiting Professor, Stevens Institute of Technology, New Jersey, USA.